Get your BFFs together for the ultimate #girlsweekend with this guide from our friends at Flight Centre. Whether you fancy the beach, snow, city or spa - we've got you covered. Saying farewell to deadlines and demands never gets old… and it’s even more fun once your BFFs get involved! Whether your pals prefer cocktails at the beach, adrenaline-fuelled adventures or chic city breaks, here are seven great girls getaways to get the gang on tour – squad goals don’t get more idyllic than this! If you just can’t get enough #foodporn, Taipei has gastronomic delights ready and waiting under two hours away from Hong Kong. Get your fill of lip-smacking street food at Raohe Night Market, discover cute cafés with charm to spare, hit up hipster bars for cheeky cocktails, or indulge in a divine degustation at contemporary restos Mume and RAW – just remember to book in advance! Located bang in the midst of the buzzing CBD, W Taipei makes the perfect base for a weekend away. 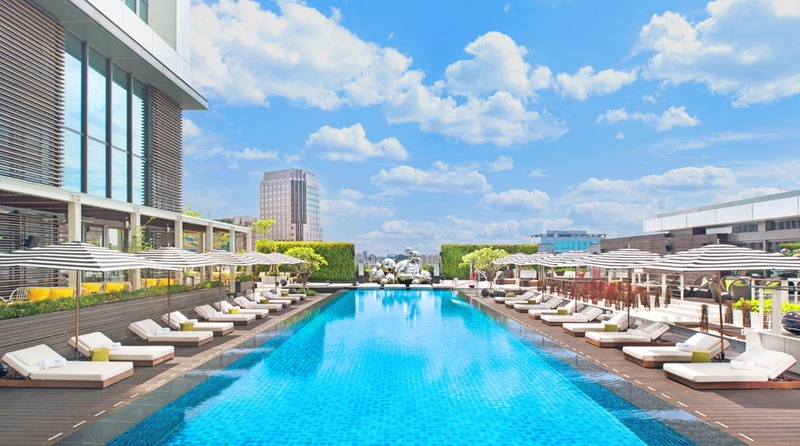 Factor in slick modern interiors, a stunning outdoor swimming pool and sweeping skyline views, including a close-up of towering Taipei 101, and you have all the ingredients for the ultimate cosmopolitan-cool city break. Find out more and book your Tapaei girls weekend here. Don your best down jackets – Niseko is the go-to Asian destination for hitting the slopes in style. Combining powdery snow with a fun après-ski scene, there are plenty of runs suitable for skiing and snowboarding newbies and seasoned pros alike. Meanwhile, a relaxing soak in one of Japan’s famous onsen hot springs is the ideal antidote to weary limbs at the end of an adrenaline-fuelled day. Get all the deets on Niseko getaways here. Turn up the luxe factor off-piste at Ki Niseko, with ski-in ski-out access, onsite onsen and a trusty valet to take the hassle out of preparing your ski gear. Groups are well catered for, with spacious two-bedroom condos or even super-sophisticated penthouses that boast incredible mountain views. Visit any time between December and April to make the most of that perfect power. What’s better than a spa day? A whole spa holiday! Discover an unparalleled pampering paradise at Vietnam’s Fusion Maia, a beachfront boutique resort in Da Nang that delivers spa treatments on tap. Unlimited spa services are included in your room rate, meaning there’s no excuse to not treat yourself – from manicures and massages to meditation and all things indulgent in-between. Competition for who can fit the most spa sessions into their stay? You’re on! Book your special spa package here. For something a little more virtuous, head down to The Farm in San Benito, Philipines, for a more decadent kind of detox – one that comes with plush villas, private pools, award-winning cuisine and undiluted tropical bliss. Forget denial and deprivation, the route to wellness here is paved with sublime spa treatments, delicious vegan dining and chilled-out yoga classes… now that’s the kind of detox we can get on board with! Book your ultimate wellness weekend here. Enjoy Middle Eastern mystique and mythology (while maxing out those credit cards!) with a visit to dazzling Dubai. Renowned for its glittering modern cityscape and unbeatable shopping, it’s also great for adrenaline junkies, with dune-bashing opportunities aplenty. Experience traditional Bedouin life with a campfire dinner under the stars after a hard day of sand boarding, 4X4 driving and camel trekking. Back in the bright lights, Atlantis, The Palm is a wonderfully opulent resort perched atop a vast man-made island. Boasting every conceivable luxury that your girl gang could need, including celeb-chef dining, a tranquil spa and a powder-white beach, enjoy incredible Arabian Gulf views and live DJ sets at Nasimi Beach restaurant’s lavish sunset terrace. Book your luxury desert escape here. Create the definitive soundtrack to your friendship at Thailand’s Wonderfruit music festival. Pack your cut-offs, shades and a vintage band tee or two, and rock out with this year’s line-up, including Rudimental, DJ Dragon and Mad Professor. Not much of a muso? Hit the innovative art, wellness and foodie stages and workshops to keep you entertained away from the main stage. Ditch the soggy groundsheet for one of Wonderfruit’s luxurious Safari Tents. Fully air-conditioned with beds, lighting and power, this is miles apart you’re your student festival experience under damp canvas! Alternatively, opt for four solid walls at the Mövenpick Siam Hotel Pattaya just 30 minutes away. The private beachfront site offers welcome respite and a quiet night’s sleep after a day spent partying. Stunning Sri Lanka is the ideal destination for a water sports escape, with the country’s south offering a spectacular introduction to scuba in warm, turquoise waters that teem with vibrant marine life. More experienced divers can tackle the coast’s many shipwrecks or, if you prefer to keep your head well above water, hop aboard one of the region’s many whale-watching charters. Get the low down on stunning Sri Lanka here. Based on the edge of the UNESCO World Heritage city of Galle, Jetwing Lighthouse Club offers an exclusive base for your exploration. Comprising just 20 rooms and two suites, the property’s old colonial aesthetic and private 24/7 butler service will whisk you back in time to a more refined era that calls for chilled G&Ts on the lawn. Maroon yourself with your BFFs on Fiji and we guarantee your message in a bottle won’t be calling for rescue! This exotic archipelago of limpid lagoons, palm-fringed beaches and verdant jungles is ripe for exploration – be it hiking, surfing or even zip wiring through the lush surrounds. Book your ticket to paradise here. Based on the exclusive private island of Denarau, the beachfront Sofitel Fiji Resort and Spa boasts one of the largest lagoon-style pools in the South Pacific, along with sumptuous restaurants and bars from which to enjoy the view. All 296 Fijian-themed rooms face the stunning aquamarine sea, meaning that you don’t have to travel further than your balcony to soak up the serenity. Hit the Waitui Veuve Bar when the sun goes down for a sophisticated glass of bubbly… or perhaps two. For assistance on your travels, visit www.flightcentre.com.hk. Flight Centre’s team of travel consultants can help you book everything travel-related, as well as make excellent recommendations. This content was sponsored by Flight Centre.